Woodbridge, VA---The Washington Nationals have announced that the organization has extended its player development contract (PDC) with the Class-A Advanced Potomac Nationals of the Carolina League through the 2020 season. The announcement was made in conjunction with Washington's extension of its PDC with the Class-A Hagerstown Suns. The Washington Nationals and Potomac Nationals will continue their partnership, which got started in the 2005 season. The most recent PDC was completed prior to the 2017 season. Potomac is set to wrap up the 2018 Carolina League regular season on Monday afternoon against the Wilmington Blue Rocks (Kansas City), and will begin the Carolina League Northern Division Championship Series vs. the Lynchburg Hillcats (Cleveland) on Wednesday night at City Stadium in Lynchburg, VA. The P-Nats are in search of their fourth Mills Cup Championship since their partnership with Washington began. 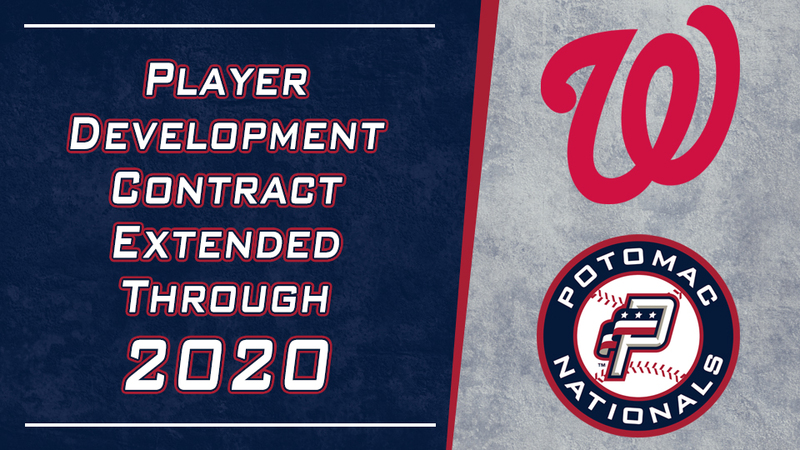 "The Potomac Nationals are delighted to renew our player development contract with the Washington Nationals through the 2020 season," said Potomac Nationals Chairman/CEO Art Silber. "The renewal of our franchise's longtime invaluable partnership with the Washington Nationals signifies that both of our clubs will continue to benefit and prosper from our player development agreement moving forward," said Silber. "It has been our pleasure and privilege to work with the Washington Nationals as a valued member of their Minor League system, and we take great pride in playing a role in the process of developing Washington's prospects into Big Leaguers." "Potomac and Hagerstown are tremendous assets to our player development system," said Washington Nationals General Manager Mike Rizzo. "Their dedication to helping produce Major Leaguers and their assistance in rehabbing our injured players is second to none. We are happy to be able to continue working with each respective organization." With the announcement, the partnership between Potomac and Washington will push past 15 years by the end of the 2020 season, with many pieces of the current Washington roster having played in Potomac in route to the nation's capital. Since Washington made the move to The District of Columbia in 2005, 81 Potomac Nationals have graduated to the Major Leagues. The past two Potomac teams (2017/2018) have seen four different players make their way to the Majors. OF Victor Robles , who played 41 games for Potomac in 2016 and then 77 games with the P-Nats in 2017 debuted with Washington in September of 2017. RHP Jefry Rodriguez made 12 appearances for Potomac in 2017 and has made six starts for Washington this season, while RHP Austen Williams spent parts of both 2016 and 2017 with the P-Nats and debuted for Washington over the weekend vs. Milwaukee. OF Juan Soto , who began the 2018 season at Class-A Hagerstown, earned brief stints with both Potomac and Harrisburg, before he earned the call up to Washington, where is currently a leading contender for the 2018 National League Rookie of the Year Award. In each of the last four years (2015-2018), a player has been with Potomac early in the season and made his Major League debut later that year. Less than 30 miles from Nationals Park, Northwest Federal Field at Pfitzner Stadium hosts all P-Nats regular season and postseason home games, and has been a pillar in the recovery process for many current Washington Nationals. In 2018, OF Adam Eaton , 3B Anthony Rendon , C Matt Wieters , 1B Ryan Zimmerman , RHP Koda Glover , RHP Jeremy Hellickson , RHP Joe Ross , RHP Stephen Strasburg , RHP Shawn Kelley , & RHP Brandon Kintzler all worked rehab assignments for the nearby Potomac Nationals.